As part of the launch celebrations for Christmas at the Gin Shack, I’m pleased to welcome author Catherine Miller who has kindly answered my Author in the Spotlight questions. You’ll find more details about the book and how to buy it below. I’m a mum to four-year-old twins. They have just started school so I can be found skipping through fields shouting “I’m free!” during school hours. Although as I’ve managed to write four books since they were born, there may be some hopes of me keeping up my writing output. When I’m not writing I enjoy baking, random adventures and gin. I’ve written since I was a teenager. It started with bad poetry and then I made my first attempt at a novel when I was about fifteen. It took me another twenty years and a couple more failed attempts before getting a two-book contract with HQDigital. I think motherhood propelled me to a new level of determination and so I went for it against the odds. Christmas cocktails! The Gin Shack is doing well, but something is amiss in Westbrook Bay and it’s down to Olive to go about saving Christmas for the local community. Originally the two Gin Shack books were submitted as The Gin Shack and The Gin Shack: Christmas Edition. It didn’t take much to agree on the final titles as The Gin Shack on the Beach and Christmas at the Gin Shack. I had to test some of the recipes for the book, so I think a Mince Pie gin is needed and I’m heading out in the evening for more cocktail tasting. It’s only right I research these things. I have a more emotional read, Forever 27, that I need to finish off, a side project, and a couple more gin shack books to keep me going. I think that’s 2018 covered. 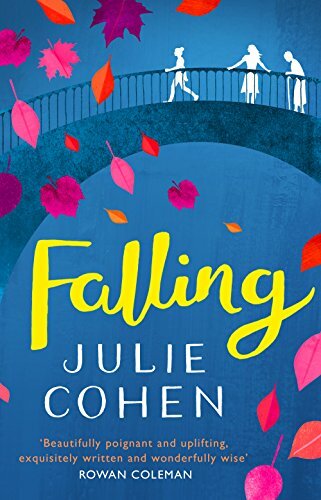 Falling by Julie Cohen. I’ve neglected my reading while writing the Gin Shack books and I’m trying to make up for that now. Welcome in the festive season with love, laughter and the perfect G&T in Christmas at the Gin Shack – the most uplifting holiday read of 2017! When Catherine Miller became a mum to twins, she decided her hands weren’t full enough so wrote a novel with every spare moment she managed to find. By the time the twins were two, Catherine had a two-book deal with HQDigital UK. There is a possibility she has aged remarkably in that time. Her debut novel, Waiting For You, came out in March 2016. She is now the author of four books and hopes there will be many more now her twins have started school. Either that, or she’ll conduct more gin research on Olive’s behalf.